ShoeMint. Where do I even begin to describe the amazingness that is ShoeMint? The website boasts a luxurious and stylish array of flats, pumps and sandals curated and designed by Rachel Bilson and Nicole Chavez. With prices of most pairs starting at $79.98 for each style and yes ladies, we're talking real leather and suede, this site is sure to be your wallet's arch nemesis. I've partnered with the ShoeMint team to give away 1 pair of shoes of your choice! Want to know how you can snag a pair? The entry is simple: Visit ShoeMint, sign up for your free personalized account and leave a comment below telling me which pair of shoes is your fav! Note you must follow the blog on either Bloglovin or Google Friend Connect in order to enter. Please leave an email address you can be contacted with. love the skirt a lot! I love the Sienna boot. You could wear it now with breezy dresses or denim cutoffs. And, you could wear them in the fall with skinny jeans. 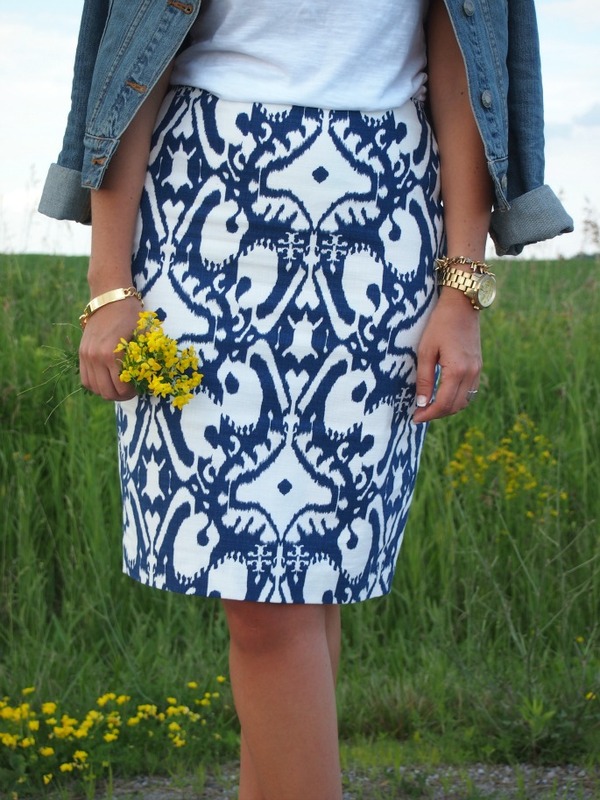 The print of this skirt is fantastic and I love those mustard wedges...great mix of colors! That skirt is a beauty! It has everything I look for in a skirt, the whole look is flawless! As a big fan of Rachel of course I love ShoeMint. Those booties are super fun and versatile, I think you can wear them all year long! Im give me those shoes! LIKE right now! They are too cute and just my style. I LOVE the Jordane...such a cool, versatile wedge! Love it paired with the skirt you're wearing! Great giveaway, thank you! Very classy and sophisticated shoes. Especially the Kate heel in nubuck. Gorgeous. Love the pattern with the color of your shoes ! Love the combination of the slightly mor formal skirt with the white tee and denim jacket! LOVE those shoes, too! Love that skirt- I swear blue and white is my go-to this season and that necklace is super cute! Elloise Black Wedges are amazing! I love this look, and I've never seen shoes quite that color before. I would enter the giveaway but I really don't need another name and password to remember that I'll probably not use. Best of luck to everyone else! Registered under hagler.hannah@gmail.com -- love the Ciella flats! Following you on both BL & GFC. Thinking about pulling the trigger on the Lola's! Love the skirt ! I am already registered on Shoemint under mlm_here@hotmail.com ! I love the thistle suede (purple) Carrie heels ! They are stunning ! Lovely skirt & gold accessories! And I love the Lina pair in black! I love the Lynne sandals. P.S. I enjoy reading your blog daily and love the fact that you are Canadian!! You look amazing, and I love that skirt! Great look! I'm lovin' the Lulu or Leslie heels. Thanks Krystin. Love this fun graphic skirt! ShoeMint is so much fun and I'm really liking the Stevie boots for Fall. I already follow you on GFC. I am in LOVE with these booties you are wearing! But I would probably choose the Charley flats and the Kate heels!!! I follow you on Bloglovin'. i love the 'ruby' in mint suede! and your skirt & shoes are killer! Love your wedges! They add a beautiful pop of color to your outfit! I love the whole outfit. It has a vintage vibe to it I think. But it's a great outfit! You look like you just walked off the set of Hart of Dixie. I love the booties you are wearing! LOVE the kate, elloise and lola. Thanks for a great giveaway! I love the Eila sandals. I love the Lori in black! Love this blue and yellow combo, hun! I love this AT skirt. Also, I'd get the Elizabeth's if I won the ShoeMint giveaway!! I love the Lulu heels! So precious! I love the Milly in Taupe Snake! So fun!! You can participate more than once, and in each one, you should identify different girlfriends and share the giveaway on your wall, in a public way. The competition starts today, 11 of July and ends on August 15th, at 24h. The winners will be selected randomly via random.org system! The results will be published between the 16th and 17th of August. YOUR PARTICIPATION WILL ONLY BE VALID IF YOU FULFILL THE 3 REQUIRED STEPS! I have to go with the Jordane in Citron! love the jordane in yellow that you have!!!! i'm always up for a bright pair of shoes to liven up an outfit!!! The Elloise are so gorgeous! I'm the wedge queen! I like the Hellin in suede. Those shoes are on another level! Love love love it! I love that skirt's pattern and the outfit's color combo. So adorable! Such a fabulous outfit! Love that you incorporate items from places like J.Crew and Ann Taylor with things from Old Navy and Target too :) If you get a minute, I’d love to know what you think of my latest outfit post! 10 more days to enter the Stella & Dot Giveaway! The skirt is fabulous! And I am rocking a jean jacket today too! It's hard to pick a favorite on such an amazing site, but I am eyeing the Kali Flat in Rose Gold! I love the shoes you're wearing!! The colour, the wedge, the design! :) Perfecto. Great giveaway! Following you on Bloglovin' and I would love the Kate or Sienna! I love the new KATE shoe!! Now on to your outfit: if this is what a country bumpkin looks like, sign me up! The print and colour of that skirt is gorgeous and I love how you kept everything simple with a basic white tee and denim jacket, but added the perfect pop of colour with those mustard sandals. My favorite pair is the Lu Lu pumps in suede. following you on bloglovin & GFC! // I am already signed up at ShoeMint -- I love the Karen pumps! The Carol heels are my favorite - I love animal print! I just came across your blog via Instagram and I am obsessed! Now following via GFC! I love the Ulla heels on ShoeMint. I love the Milly boots! Shoemint and I go way back, and so does your blog on my Bloglovin' roll... I'm currently drooling over the Milly ankle boot. Thanks for a great giveaway, definitely keeping my fingers crossed! I like Ahlberg and Elloise! I follow on bloglovin! I adore the Lola in black. I can think of endless outfits with which I can pair those babies! I follow on bloglovin' and I can be reached at lotz(dot)elise(at)gmail(dot)com. I signed up for shoemint and my fave (right now, I'll probably switch it up once I've scoured he site longer) is the LuLu in white. Love your shoes! nice choice. This could be bad... I love shoes. I have set up my account, I follow on bloglovin and GFC. Can't get enough of your cute style. I need a good black wedge for the upcoming fall and ABI would complete my style. My email is edwards.arianna@gmail.com.. Thank you! Head to toe, love this look! Went to Ann Taylor and the skirt has been recalled due to dye/running issues. Be careful when laundering!